I know for me, vacation means exploring a new place, relaxing, and getting away from normal life for a while. But it also means good eating. I especially like to try typical or traditional foods in new places. Cartagena does not disappoint in that regard and is increasingly becoming a foodie destination. 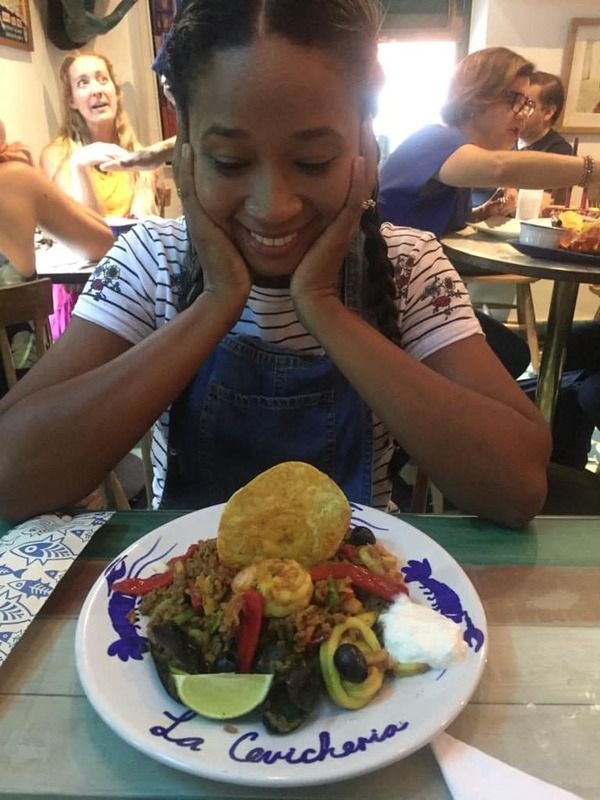 I’m going to channel my best Anthony Bourdain impression here, so read on to learn about the top 10 best foods to try in Cartagena, Colombia. Look how excited Susana is to eat this seafood rice. Read on to learn more about it and the other must try dishes in Cartagena. There are lots of restaurants in Cartagena serving up not only local, but also national and international fare. No matter what you’re looking for, you can probably find it in Cartagena. There are also some great Colombian dishes from other parts of the country like the Bandeja Paisa and Ajiaco. 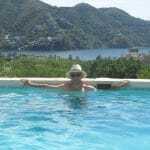 However, in this post, I’m going to be focusing on the best traditional food in Cartagena. These are local favorites that embody the Caribbean flavor of Cartagena. Not surprisingly, there’s a fair amount of seafood on this list of the best Cartagena dishes to try. However, even if you’re not a seafood fan, there’s something for you. So bring your appetite and read on for the 10 best local foods you have to try in Cartagena! This typical fried fish plate is perfect for lunch at the beach and is without a doubt number 1 on our list of dishes you need to try in Cartagena. A classic Colombian coastal dish. Typically, the fish is a mojarra roja (tilapia) and is fried to a nice, golden crisp. It is usually served with coconut rice and patacones, fried plantain patties (often called tostones elsewhere in Latin America). Both of those sides are also traditional Cartagena dishes. 3 local classics in 1 means this easily qualifies as number 1 on the list of the best traditional meals in Cartagena! It is an especially good choice for lunch at the beach! For me, a big juicy fish and ice cold beer is synonymous with the beach in Cartagena. They do serve you the entire fish, so if you’re not used to that it might take some practice to avoid the bones. The trick is to eat one side, then flip it over to eat the other. Don’t worry, you’ll be an expert in no time! If you want a different spin, try getting sierra (Spanish mackrel) fish medallions, pargo (red snapper) or róbalo (sea bass), the fish pictured above. Regardless of which fish you get, the typical fish plate is one of the foods you have to try in Cartagena. You can also try it sudada, stewed with vegetables. If you think you can’t handle the full fish, then at least go for a filet. For a super seafood experience, try a filete a la marinera, a fish filet covered in a seafood sauce with shrimp, clams, and calamari. This seafood stew is also a Cartagena favorite. Usually a cazuela has shrimp, calamari, and clams. Some may also include fish and even lobster as an added bonus. Cooked with coconut milk, the Cazuela de Mariscos is almost a Caribbean version of seafood chowder. It is also usually served with a portion of coconut rice and patacones. Creamy and delicious, it lands second on the list of best foods to try in Cartagena. All that seafood also makes it an aphrodisiac. If you haven’t caught on, the seafood in Cartagena really shines. Next up on our list of traditional dishes you should try in Cartagena is Camarones al Ajillo, shrimp in a garlic, butter, and white wine sauce. The best places also throw in some cream to get the sauce nice and thick. This is probably my wife’s favorite dish. If it’s on the menu, there’s about a 75% chance she’s going to order it. That’s how good it is! (I mean garlic and butter sauce, need I say more?). You can also order this dish with prawns, Langostinos al Ajillo. Really, any seafood cooked al ajillo is delicious (again, garlic and butter). For the landlubbers, chicken is also good cooked al ajillo. So do yourself a favor, and if you don’t get the shrimp, get another variation of this must try dish from Cartagena. Your tastebuds will thank you. Posta Negra might be considered a Cartagena comfort food. It is a beef dish similar to a roast, although it is actually traditionally seared then slow simmered on the stove top after marinating overnight. What makes it unique is the sweet and savory sauce. There are different variations, but all are made with panela, unrefined brown cane sugar, and Worcestershire sauce. Many also include Coca-Cola. Traditionally a meal using a tough cut of meat and cheap, simple ingredients, posta negra, sometimes referred to simply as posta cartagenera, is a unique example of Cartagena’s working class’s culinary heritage. Even many of the city’s finest restaurants have taken to offering it on their menus in an homage to all the abuelitas who have prepared it over the years. It’s status as a local, Sunday favorite lands it on this list of the local foods you should sample in Cartagena. Colombians love soup. I know many who don’t consider a lunch complete without a soup to start. The most popular type of soup is a sancocho. Sancocho is a hearty soup with meat and root vegetables. It usually has yuca, plantains, and potatoes along with cilantro and onion for flavor. Corn on the cob is also frequently included. The meat differs. 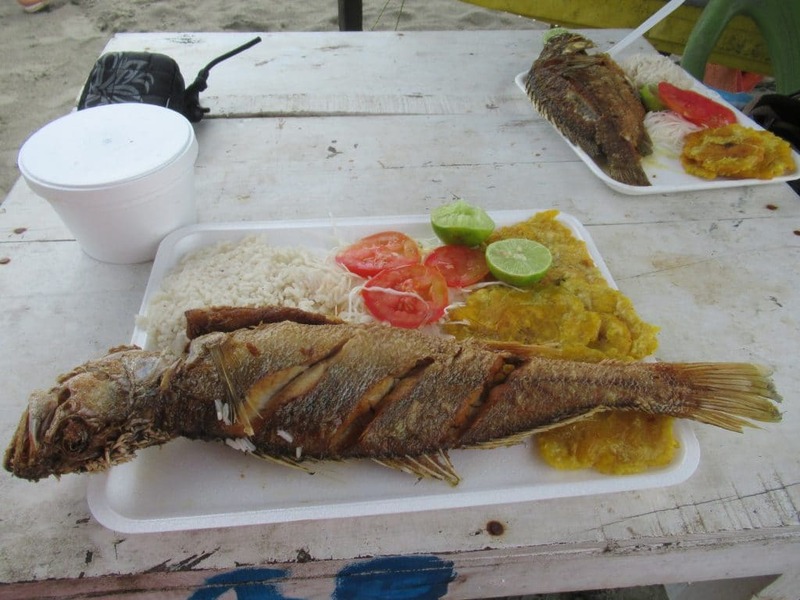 The most commonly served in Cartagena is Sancocho de Pescado (fish). You may also see Sancocho de Gallina (chicken or hen), Sancocho de Costilla (beef ribs), or even the Sancocho Trifásico (with beef, chicken, and pork). 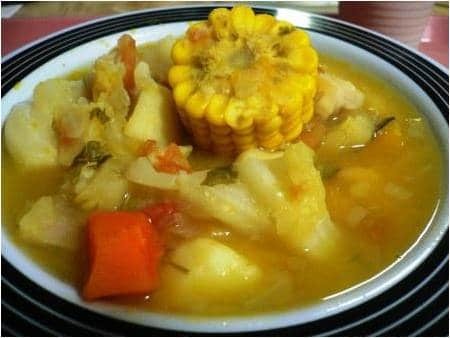 Sancocho is another a popular Sunday food. It is also popular for get togethers and parties. Think of a barbecue where every one hangs out drinking beer waiting for food, only instead of burgers, it’s a big pot of soup roasting over a fire! If you have Colombian friends and get invited to a sancocho, absolutely take them up on it. But even if you’re only able to try it at a restaurant, sancocho is still one of the foods you have to try in Cartagena! 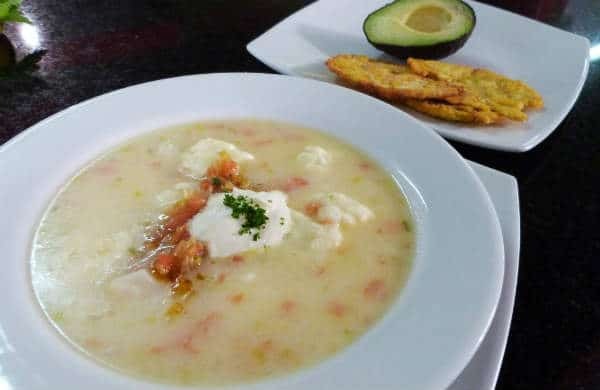 Mote de queso, a cheese soup, is one of the most unique foods to try in Cartagena. Next up on our list of foods to try in Cartagena is another soup, a very unique cheese soup! Mote de Queso is made with chunks of the salty, crumbly costeño cheese and ñame, a root vegetable similar to yams. It also has onions and garlic. It is honestly a bit of an acquired taste. While I don’t dislike it, I do think it’s a bit different. However many cartageneros, my wife Susana included, swear by it and get really excited to eat it. Certainly a unique dish, Mote de Queso is another traditional food to try in Cartagena. 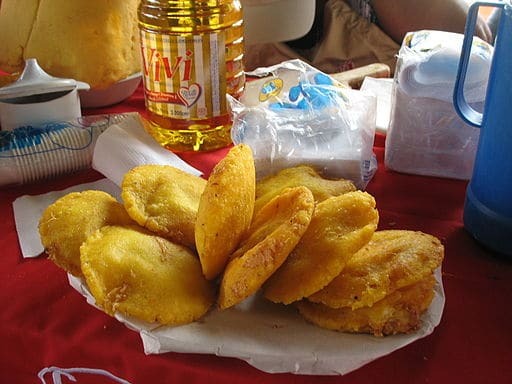 Arepas, grilled or fried corn meal patties, are common all over Colombia and Venezuela. In fact they date to well before the Spanish conquest. However, there’s a unique spin on the arepa on the Colombian coast. Before being thrown into the frying pot, the arepa is stuffed with ground beef and an egg is cracked inside the arepa. The finished product is a golden brown, crunchy, greasy, stuffed arepa. The arepa de huevo is perfect for a quick breakfast on the go or an afternoon or late night snack. They can be found at stalls as well as bike sellers all around Cartagena. Especially good are the ladies on the corner diagonal from the Exito San Diego near the India Catalina. For an even more better treat, just past the corner is Donde Magola. There they serve up traditional arepas de huevo but also variations filled with different ingredients. You can get your arepa de huevo there with chicken, sausage, shredded beef, or even shrimp! My personal favorite is the chicharr´´ón (fried pork). There’s also great homemade sauces. 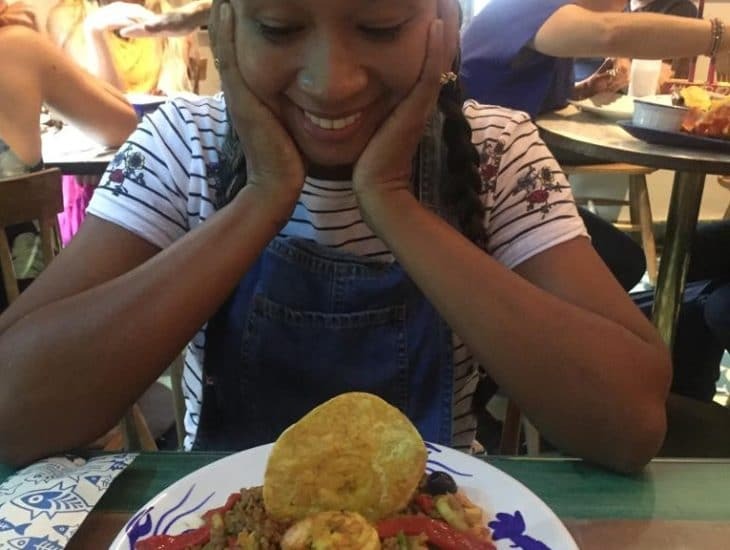 If you happen to be in Cartagena in late January, check out the Festival del Frito, an entire festival devoted to the arepa de huevo and other popular fried street foods. If you’re looking for street food and the Arepa de Huevo isn’t enough for you, then try a Patacón con Todo. These patacones are longer than the standard ones served up with your fish or cazuela. This longer patacón serves as the base of a heaping mound of, well todo (everything). Usually that includes beef, chicken, chorizo and butifarra (types of sausages), and cheese. It is then topped off with crunchy shoestring potatoes and full complement of sauces. The patac´ón con todo makes for a great street food dinner or late night meal. If Susana doesn’t order camarones al ajillo, then there’s a pretty good chance she is going to order arroz de mariscos, or seafood rice. Nearly every restaurant serves this Cartagena favorite dish. It mixes two of cartageneros’ favorite things, rice and seafood. Usually, this seafood rice has shrimp, clams, fish and calamari. Similar to a paella, arroz de mariscos is cooked together and tends to be a wetter rice. You might also see this called arroz marinera. The arroz melosa is a creamier version similar to a risotto. All make for an excellent meal and the arroz de mariscos is absolutely one of the local foods worth trying in Cartagena! 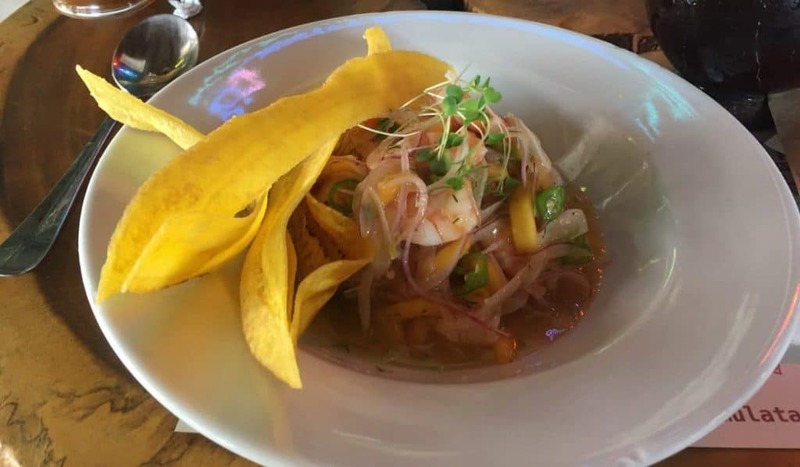 Spicy shrimp ceviche is just one of the variations of this local food to try in Cartagena. If you notice the plate in the photo above, it is from La Cevichería, made famous during a visit by the late Anthony Bourdain. They have some awesome ceviche (and bomb hot sauce) but also some great other dishes. However, there is great ceviche all over Cartagena. Nearly every restaurant serves at least one variation, and it makes for a great appetizer. Although not unique to Cartagena, ceviche is certainly a seafood favorite. If you want a cartagenero take on it, look for one that includes suero sour cream and/or coconut milk. There you have it, the top 10 local Cartagena dishes you have to try during a visit. Thanks for taking the time to read. I hope you enjoyed it, but I hope you take the time to enjoy these 10 traditional Cartagena foods even more! Interested in learning more about Cartagena’s food scene? Check out these 15 recommendations for places to have a romantic dinner in Cartagena. Check out these 15 street foods to try in Cartagena. Check out these places to have sunset drinks in Cartagena. Ready to plan your culinary experience in Cartagena? Check out our Insider’s Guide to the Best Areas to Stay in Cartagena. Check availability and deals on booking.com for your dates below. This entry was posted in Eats and Drinks and tagged What to Eat and Drink. Bookmark the permalink.